Whether you’re headed for a day at the pool or a weekend at the beach, you’re going to need to bring the necessities with you…so why not look cute while doing it? 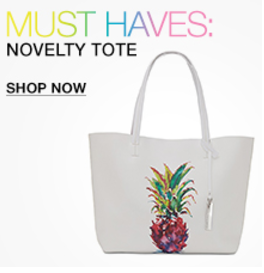 That’s why this summer’s must-have bag is the novelty tote. Obviously, you need a tote big enough to carry everything for keeping cool and hydrated all day, but it can be stylish and practical too. After all, since you’re wearing less during the summer, your accessories need to make even more of a statement for you. And perhaps my favorite pick is available right now for just $20.03! Which one is your favorite? Let us know over on our Facebook page.